Of course, Le Tour de France is a real tour de force of cycling, endurance, and athleticism, but it is also an opportunity to see some amazing styles and designs for cycling jerseys! The cycling jerseys of the Le Tour de France blend the practical with the stylish, and below we have put together a list of five cool cycling jerseys from this year’s competition. This luminous looking cycling jersey comes in a fresh pale greenish yellow hue. The circular neckline gives it a futuristic feel and the whole effect is lively and very energetic. 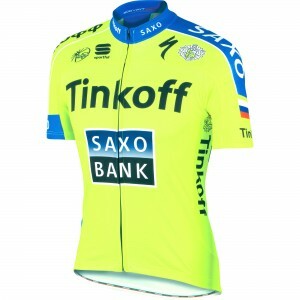 Of course, the Team Saxo – Tinkoff cycling jersey is emblazoned with the team’s main sponsors and partners, such as Citroen, Sportful and Specialized. This team’s cycling jersey comes in a clean, white hue. This creates the impression that this team truly means business! 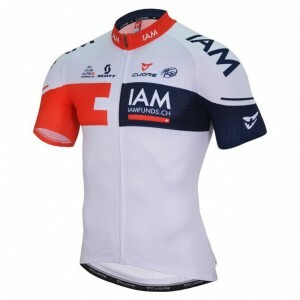 A red collar adds a flash of brilliance, and the red and dark blue trimmings of this polyester jersey have a simple, contemporary look to them. The main sponsor of this Swiss team is Independent Asset Management (IAM), and the sponsor’s name is incorporated deftly into the design. Lighter colors such as this one (and the Team Saxo – Tinkoff jersey) may well be better for players if the weather is very hot and sunny. You can’t go wrong with black! This was probably the mantra of Team Sky, which has created a slick, sleek number for the Tour de France. Even better, these cool cycling jerseys were tested in a wind tunnel, to ensure that they could withstand even the fastest of speeds that the team’s cyclists could throw at them. 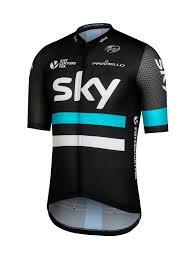 As one of the most popular replica cycling jerseys for men, these ‘aero jerseys’ come with a cool mint blue strip and, of course, the names of other key sponsors such as 21st Century Fox and Pinarello incorporated on the chest area. Team Bora Argon has gone for a similar overwhelmingly black jersey. This cycling team’s jersey is perhaps the most eye catching, as it comes in a stunning pillar box red hue. You certainly will not miss them on the road! Ridley, G&V Energy Group, and other significant sponsors are added onto these jerseys in a way that fits in perfectly with the cool red, white and black colors and the simple yet effective and memorable design. One of the coolest things about these jerseys, though, is the back: when the team turns away from you, you will be able to see a striking yellow and black vertical stripe running down the right of the jersey. This asymmetry is subtle yet powerful. This is the team that wears its sponsors’ names most proudly, perhaps. 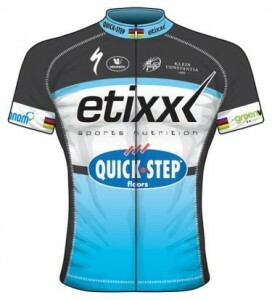 You could never mistake the fact that team Etixx – Quickstep is sponsored by the renowned nutrition experts Etixx and the flooring professionals Quickstep. 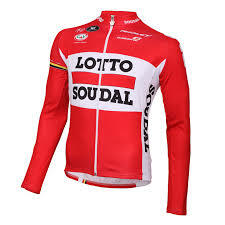 Other co-sponsors include brands such as Lidl and Peugeot, and these brand names can be seen in smaller sizes on the top half of the jersey. A deep, dark blue hue works very well with the thick black stripes along the chest and down the sides of this imposing looking jersey.